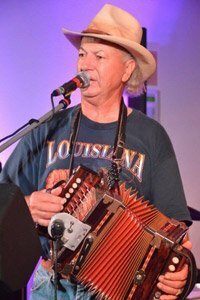 Joe Douglas began singing Cajun music at the age of six and by age nine he was writing it. He got his first big break when he appeared on a special Wanda Jackson Show in Snyder, Texas. Then in Tyler, Texas, he met Robin Hood Brians, with whom he worked on his first recording session. On the Swamp Fox label, he recorded and released a Cajun Rock version of Cat Stevens’ “Wild World.” This song went nearly to the top of the charts in Texas and Louisiana and did very well in the west. This showing led to television shows and personal appearances in Los Angles, and throughout Texas and Louisiana. Joe first appeared on the GRAND OLE OPRY in Nashville in 1973, and then appeared on The Wilburn Brothers national television show. He toured with Merle Haggard, Ronnie Milsap, Eddie Rabbit, Conway Twitty & Loretta Lynn and Charlie Rich. He has also performed in Las Vegas with Glen Campbell and Mel Tillis.